George Leslie, Jr. of Bairdford, West Deer Township, Allegheny County, PA, was my Great-great-great grandfather. We believe that he was born sometime between 1761 and 1769, in New London Township, Chester County, PA. This was at least a decade earlier than the birth of James Gray, my mother’s direct great-great grandfather whose son, William Sylvester (1816-1879), married George Leslie’s daughter Elizabeth (1818-1895) and inherited a portion of the family farm. While we believe that James came directly to Western Pennsylvania from Northern Ireland with families named Boyd and Fulton [see “Introduction: Gray”], George apparently lived with parents and family, including his brother Alexander, for a time Eastern PA before marrying in 1802 and settling on cheap government Depreciation land just north of Pittsburgh. But, George’s contribution to the American frontier was short-lived. You see, George died an early and tragic death of Typhoid Fever in 1821. That same week four of his eight children and others in the Leslie extended family also died of the dread disease. Just five years later another of this George’s family, a daughter, joined them in the grave after suffering from Tuberculosis. Among the five headstones marked George Leslie at the Bull Creek Presbyterian Church Cemetery are ones whose dates are illegible. Considering that the oldest legible stone in the churchyard is dated 1804, none of the Typhoid victims’ graves is marked, and other Georges lived much later, that stone could very well belong to this patriarch. According to the Leslie’s astounding Original Family Narrative and family tree, George’s wife, Jane Guilliford (1776- ), having birthed their final child at age 44 and after burying five offspring and a husband, continued to operate the farm and lived a long life. She just may have been listed on that old worn Bull Creek stone as well. 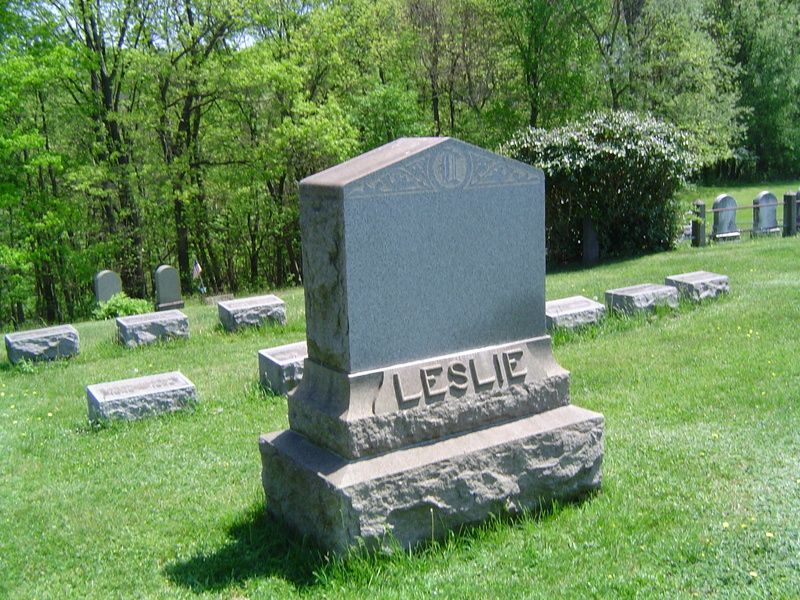 Leslie Family stone, Bull Creek Cemetery, West Deer Twp. Recently, we uncovered information that takes us back yet another generation to George Leslie, Sr., born sometime between 1736 and 1740, probably in Northern Ireland or Scotland. We know that there were no Leslies in Chester County before 1756, but there was a George “Lessly” listed as a “freeman” in that year, that is at least 21-years old and single. The next year he is crossed off that list, indicating that he had married. A son, William (1759-1850), followed shortly. From 1758-1764 George, Sr. paid taxes as an “inmate,” that is “married and living in the household of another.” For the next 13 years, he apparently owned various land in Chester County, up to 165 acres. His wife Mary (b. 1719-after 1804) is mentioned in at least one of the deeds. During that time he served as a deputy constable for the Common Pleas Court of New London Township. It is recorded that in 1767 he got in trouble for not turning over property he had confiscated during his official duties to the court. The property, we learn, amounted to several feather beds and a chest of drawers. By Court order he eventually delivered the bedroom furniture to one John Whiting, the plaintiff. In 1777, the year after the signing of the Declaration of Independence, George took the oath of allegiance to what was to become the United States. Later that year he was drafted into the Pennsylvania Militia at nearly 40-years of age. Under the law, his son William was able to serve in his place. The following year George moved his family westward to Hopewell Township, Cumberland County. The old tax records there show him owning 2 horses and a cow. By 1785 he moved again, to nearby Pennsboro Township, and finally, in 1790, George, Sr. made his final move, to Bairdford, West Deer Township (then Pitt Township), Allegheny County north of Pittsburgh. The earliest Census lists George, Sr. with 5 sons, a wife, and a daughter. While we don’t know when Mary died, church records indicate that George, Sr. passed in 1821 at age 85. As we said earlier, this was the year of the great Typhoid Fever epidemic that killed his second son George, Jr. and so many others in his extended family. We believe that they are all buried in the Bull Creek Presbyterian Cemetery, West Deer Township. 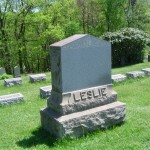 There are altogether two-dozen graves marked “Leslie” in the old Bull Creek Cemetery, as many as any other Scotch-Irish family in those parts. We can’t possibly know how they’re all related nor their individual stories, but this article will provide the origin of the name, list some famous Leslies, and connect to at least one family that we grew up near and didn’t even know we were related to. After this history lesson, study the family tree, then enjoy the old narrative and contemporary interpretation and analysis. According to the Clan Leslie Society, the family was founded in 1070, during the reign of Malcolm III Canmore, King of Scotland. The official House of Leslie in Lesselyn, a pastoral parish in Aberdeenshire, wasn’t recognized for over a century, 1177. Malcolm was the son of an Hungarian named Bartolf, or Bartholomew, who had married one of the king’s sisters after the king married the sister of Bartolf’s nobility. The charter came from David, the Earl of Huntington, and brothers of King William “The Lion,” who were known by the name Garioch. Acquaintances say that Bartolf was both strong and intelligent. The Leslie name was not legally recorded for another 200 years with Sir Norman, found in the “Ragman’s Roll” for the Scottish War of Independence. His son and grandson fought with Robert Bruce. The Parish of Lesselyn, or Leslie, in Aberdeenshire was the family’s principle fortified residence, a real castle, so the name has carried through even to this day with the naming of Ian, 21st Earl of Rothes, Chief of Clan Leslie. The history of the name from Norman to Ian is long and complicated involving nobility from around Europe. In one family history written in 1692, the boast was made that at one time three Leslies were generals in five kingdoms: Walter in Germany and Austria, Alexander in Scotland and Sweden,and Sir Alexander in Muscovy. At one point, the Leslie crusaders had returned home later than expected to find their estates passed on to kinsmen and controversy over seats of power. It’s said that in one battle, an attack on Aberdeen by Donald, Lord of the Isles, Sir Andrew Leslie’s troops were outnumbered ten to one, and he lost six sons. This became the inspiration for Sir Walter Scott’s The Antiquary. Three grandsons of Sir Alexander – John, George, and Henry – came to America in 1781 and settled in Philadelphia. This was years after our George had come to fight for the Colonists. One of the problems in doing Leslie family history is the repetition of names, especially, in our case, George and Alexander. Spellings of our surname include Leslie, Lesley, Lesly, Lessley, Lesslie, and the famous “write it as it sounded” Lasley by the Rev Abraham Boyd, the Western Pennsylvania minister who married several of our ancestors, including James and William Gray. Scottish septs, or in-laws, include Abernathy, Bartholomew, Carney, Lang, and Moore. The two main branches are the Rothes and the Balquhain. Alliances were formed with the Lindsays, Ogilvies, and other powerful families to protect their northern and western district against raids from the highlanders and islanders. Not only did the Leslie fame spread, but so did their leadership. There were those generals with the Leslie name commanded armies throughout Europe Furthermore, while other Leslies either advised the Crown, taught in universities, or became influential from the pulpit. Perhaps John Leslie, Bishop of Ross, is most famous for his work, A History of Scotland, written in the vernacular for Mary Queen of Scots. The clan recognizes two tartans, green, the regimental color, and red, the ceremonial. Amy (1855-1939) of Iowa was an opera singer and the only female drama critic in Chicago. I was surprised to see many old newspaper clippings involving the Leslies of Butler County in my Grandmother Bessie Reed Hill Pearce’s file. Yet another connection between our Gray and Pearce families exists as her cousin Margaret Hill [see “E-Gen: Hill” ] married Russell W. Leslie. They had six sons. Russell’s parents were each sheriffs of Butler County at separate times. His father, Samuel M. was born in 1868, farmed, and was Justice of the Peace for 33 years before becoming the county’s chief law enforcement officer in 1926. He was also a school director. Samuel’s father was Samuel A. and fought in the Civil War. His father was Alexander of Mercer County, PA, who was a State legislator. I believe it was Samuel M’s son John who farmed the hillside across from my maternal grandparents, Paul and Bertha Gray in Middlesex Township. I don’t, however, know the connection, if any, between these Leslie’s and the George Leslie’s of West Deer Township, Allegheny County, PA. Research is continuing. Meanwhile, I have received e-mail from Leslies who believe there is a connection between our George who died in 1821 and at least one George dating back to 1736 Scotland. There are also Williams and Johns in this line. The 1840 U.S. Census Pensioners for Revolutionary or Military Service, East Deer Township, Allegheny County, lists a William Leslie born in 1759 who was residing with Thomas Leslie, probably a son. Was that William a cousin or older brother to George? We’ll continue to search for the answer. Fortunately, the Scottish naming pattern for children has been helpful, although not foolproof, in making intelligent connections in all my families. [See “Scottish Names.”] The most common names among the Leslies and Grays over 250 years have been George, Alexander, William, Robert, James, Mary, Elizabeth, Sara, and Margaret, to name a few. And upon all Scots in the world. And to be of one mind and heart toward the preservation and honor of Our shared heritage in Clan Leslie. All this we ask through Jesus Christ, Who liveth and reigneth with Thee and the Holy Ghost, Ever one God, World without End. All, with the exception of the first George and William, born in Allegheny County. I struggled with Thomas, Sr. for a very long time. I know he was Thomas, Jr’s father for the fact he is listed as such on Thomas, Jr’s death certificate and he is buried in the Leslie Plot (C97) in Prospect Cemetery, Brackenridge, Allegheny County along with his son and daughter-in-law (Barbara Smith) among others. I spent much time perusing the Census pages from 1790-1850 trying to make the Thomas’ connection and to maybe identify the parentage of Thomas, Sr. The 1840 Census, of which you speak above, was an AHA moment for me. The dates and ages matched somewhat with what I already knew. William was explicitly stated to be 81. The HOH was Thomas, who was between 40-50 per the census, would put him in that birth range listed above. There were two boys between 10-15. That would most likely be Thomas, Jr. (12 years old in 1840) and his older brother William (14 years old in 1840). I don’t know yet who the older brother and sister who are also included in the household. Their mother passed away before 1840. Anyway, I thought I would share this information about William and his descendants, since they are my direct line and you and I are cousins, lol. I still need to make a trip up to PA to do some research on who Thomas, Sr.’s wife was and more about the first George. As you can see, Thomas and George are important names in my family. My son’s and grandson’s middle names are Thomas. We will carry it on! !